Anthony Quackenbush is a Miami Surgery Error/Mistake Lawyer who fights hard for victims of medical malpractice. All types of surgery errors/mistakes can and do happen during various procedures. Surgery errors/mistakes can occur before a procedure, during a procedure, or after a procedure. For example, before a procedure, a surgeon may make a bad decision to operate when a surgery really isn’t necessary. Or the doctor may decide to perform the wrong type of surgery, or use the wrong tools. Oftentimes, doctors may be motivated to perform surgeries, or to perform certain types of surgeries, for financial reasons. Surgeons may make a lot of money performing surgeries. Or they may make more money performing certain types of procedures as opposed to others. Mr. Quackenbush will work in your case to try to obtain evidence that your doctor performed surgery or performed a certain kind of procedure for financial reasons. If he can prove this, then he will use it in your case. A doctor may also decide to perform surgery, or decide to perform a certain type of procedure, based on an incorrect diagnosis. If this occurs, then the doctor that made the incorrect diagnosis will be responsible. Lastly, your surgeon may decide to perform surgery even though you have other “co-morbidities.” If this occurs and you have a bad result, then the doctor will be liable. A co-morbidity is another medical condition other than the condition for which you’re being treated. For example, you might have high-blood pressure and an injured neck. If the surgeon decides to operate on your hurt neck and you have a health emergency during the surgery du to your high blood pressure, then the surgeon will be liable for the consequences. After all, if the surgeon knew that you had high-blood pressure, then he or she shouldn’t have performed the surgery. On the other hand, if the doctor didn’t bother to determine if you had high blood pressure, then again he or she will be responsible for not exercising due diligence. Many surgeries require you to get a surgical clearance before going through the procedure. If your surgeon fails to do this and you have a bad result as a consequence, then your surgeon may be responsible. Should you be the victim of a surgical error/mistake anyplace in Florida (including Broward County, Fort Lauderdale, West Palm Beach and Palm Beach County), contact Mr. Quackenbush at 954-448-7288. You are entitled to compensation for your injuries and can receive it with the help of this Miami Surgery Error/Mistake Law Firm. Mr. Quackenbush will discuss your case with you at no charge to you. Surgery errors/mistakes may also happen during the actual procedure. One thing that is typically administered during surgery is anesthesia. This drug serves to control the pain-level of the surgical patient. Anesthesia may either be “local” (typically given in an injection to control pain at a specific part of the body) or “general” (where the patient is “put under” or made to be unconscious during the surgery). Nevertheless, anesthesia may be given in levels that are too high. If this occurs, then a patient may develop an adverse reaction. In worst case scenarios, the patient may enter into a persistent vegetative state/coma. Or a patient may tragically pass away as a result of too much anesthesia, or the wrong type of anesthesia, being administered. 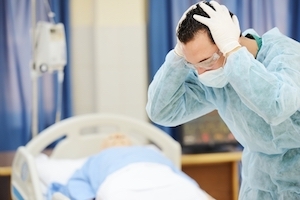 If your loved one has tragically passed away as a result of a surgical error/mistake, then you may be able to bring a wrongful death case on your loved one’s behalf. In such a case, it will be necessary to establish an Estate. Once the Estate has been established, you or another family member/relative will be named as the “PR” (“personal representative of the Estate”) to carry the case forward. Compensation from the case will go to your loved one’s survivors (also referred to as the “beneficiaries of the Estate”). However, there are restrictions on who can be such beneficiaries in a medical malpractice wrongful death case, so it is best to contact Mr. Quackenbush as soon as possible. Occasionally, surgeons operate on incorrect body parts. For example, your surgery may be intended for your left arm, and instead the doctor accidentally operates on your right arm. Additionally, surgeons occasionally operate on the wrong patients. For example, perhaps a patient in hospital room 10 is supposed to undergo surgery, but instead the surgeon negligently grabs the wrong hospital chart and operates on the patient in room 11. The surgeon will clearly be liable in these situations. Occasionally, objects are left in patients’ bodies after surgeries. For example, surgical instruments and tools, sponges, needles and other objects have been known to be left in surgical patients’ bodies. If this occurred to you and your medical condition was harmed as result, then you may be able to pursue a medical malpractice case. Infections also frequently develop after surgeries. This can occur as a result of unclean surgical tools or instruments. It may also result due to unclean hands of a surgeon/doctor, nurse or other medical staff member. For example, a medical provider may fail to wash his or her hands before a medical procedure and infect a patient as a result. Finally, surgeries may be performed in unsanitary environments. For example, operating rooms (“OR’s”) are supposed to be properly ventilated. If they aren’t, then dangerous bacteria may develop in the air and may infect surgical patients as a result (for example, through an open wound created during the procedure). During surgery, surgeons may accidentally harm body parts other than the body part being operated on. For example, the doctor may accidentally “nick” or puncture organs, veins, arteries or nerves. Dangerous internal bleeding (hemorrhaging) and infections may develop as a result. If this occurred to you and catastrophic results ensued, then you may be able to pursue a case against the doctor whose negligence injured you. The defense in your case may argue that the complication that developed during or after your surgical procedure was a “known risk” of the procedure. That is, the defense may argue that your complication develops every so often after your procedure, and that there is nothing that could have been done to prevent it. Your surgery was necessary, the defense may say, and sometimes the complication develops – but it was not the fault of your doctor. However, doctors are supposed to explain known-risks of procedures to their patients and obtain “informed consent.” That is, a patient must give informed consent before a procedure is done. Your giving informed consent means that you have been informed about risks of a procedure and consent to the procedure anyway. If you never gave informed consent to your doctor before the procedure, then you may be able to pursue a medical malpractice case against the doctor. On the other hand, you don’t need to simply concede that your complication was a known-risk of your procedure. That is, you may still be able to argue that your surgeon didn’t live up to the “standard of care,” and that’s the reason your complication developed – and not just the fact that it sometimes happens as a result of the procedure. In other words, you may be able to argue that it was your surgeon’s negligence, rather than just the procedure itself, that caused your injuries. If you are the victim of a surgical error/mistake anywhere in Miami-Dade County (including Aventura, Coral Gables, Cutler Bay, Doral, Florida City, Hialeah, Hialeah Gardens, Homestead, Key Biscayne, Miami Beach, Miami Gardens, Miami Lakes, North Miami, North Miami Beach, Opa-Locka, Palmetto Bay, Pinecrest, South Miami, and Sunny Isles Beach), call Mr. Quackenbush today at 954-448-7288. He will discuss your case for free.